Coverage: Commentary on BBC Radio 5 live, text updates on the BBC Sport website and mobile app. With weights to be carried in the 2017 Grand National at Aintree revealed on Tuesday night, here’s a look at some of the leading contenders. Second time lucky for Bailey? Grand : Kim Bailey knows all about the elation of winning the most famous horse racing prize in the world, but also all about the draining disappointment of just missing out. In 2016, Bailey-trained The Last Samuri, ridden by jockey David Bass in the blue and yellow silks of owners Paul and Clare Rooney, looked for much of the four and-a-quarter miles-plus set to provide Bailey with a second success after Mr Frisk (1990). It was only in the final strides that the nine-year-old gave way to Rule The World. “Jumping the second last, I felt like I’d won the Euro lottery again,” said Bailey, “but then it wasn’t much fun really. The Last Samuri has already been back to Aintree, putting in a huge performance when third, conceding weight all-round, in the Becher Chase staged over a shorter version of the Grand National course in December. Now it’s all systems go for a retrieval mission, and Bailey is relishing the prospect. He said: “I’m really happy with him and will go to Doncaster for the Grimthorpe Chase, which he won last year and then, all being well, straight on to Aintree. In a race in which good fortune plays such a starring role – as we especially recall this year, a half-century on from 100-1 shot Foinavon’s dramatic victory – trainer Lucinda Russell is hoping One For Arthur hasn’t used up too much of his in advance. The eight-year-old has enjoyed a profitable season with wins at Kelso and Warwick and a creditable fifth place over the famous fences in the Becher Chase. Jockey Derek Fox has ridden each time. The races haven’t been entirely plain sailing however. Kinross-based Russell, trying to bridge a 38-year gap – Rubstic was in 1979 – since a Scottish-trained horse won, said: “At Warwick he was hampered and nearly brought down at the second [fence], and the plan in the Becher Chase was to be prominent but he nearly brought himself down there, so Derek had to ride him patiently. One For Arthur, who’d be a fourth Grand National runner for the Russell team, is owned by the Two Golf Widows, Deborah Thomson and Belinda McClung, who are counting off the days to the big day. No-one will be watching the revealing of the weights for this year’s Grand National more than the team behind Highland Lodge. Agonisingly, despite winning last season’s staging of Aintree’s Becher Chase, the horse ‘missed the cut’ for the Grand National, ending up just below the top 40 in the handicap which get the chance to line up. This time around, a narrowly-beaten second place in the Becher Chase, plus the hope that the handicapper will employ the so-called ‘Aintree Factor’ when allotting his weight, should ensure a place for the Jimmy Moffatt-trained 11-year-old. And for an event famous for throwing up some of British sport’s most enduring fairytales, what a good fit this story would be. Moffatt, based in rural Cumbria, heads one of racing’s lesser known stables, and he trains Highland Lodge for owners Simon and Julie Wilson, whose teenaged son Patrick died as a result of a brain tumour just months after leading the horse into the winners’ circle following his Becher Chase victory. To add to the potential piquancy, jockey Henry Brooke is again due to ride having recovered from a fall that left him in an induced coma in October. Brooke said: “He really knows how to wing those fences which is good, and I think that he’s definitely got what it takes to get placed in a National, if not win one. The veteran Vics Canvas, who left his 100-1 odds behind when a gallant third in 2016, remains on course for this season’s race despite not having competed since. 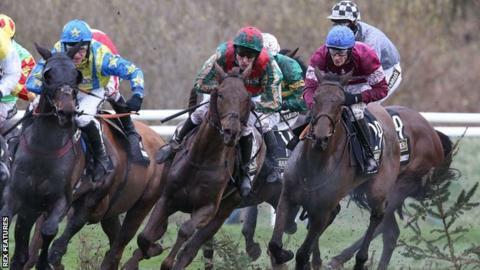 Part-owner Gary O’Brien, one of BBC Radio 5 live’s four-strong big-race commentary team, says the 14-year-old was only due one or two races this season, and suffered a ‘knock’ while being prepared for a race at Kelso before Christmas. However, County Meath trainer Dermot McLoughlin reports the horse has all his “old enthusiasm” about him, and is on target for a possible career swansong on 8 April. Though Vics Canvas would be the oldest winner since Peter Simple, 15 when successful in 1853, he’s the same age as Aintree regular Oscar Time was when finishing 15th behind Many Clouds in 2015. Sure to give a run for supporters’ money. Irish-trained horses, looking for just a second win in 10 years after a splurge in the mid-noughties, are set to dominate the top of the handicap for the Grand National. The Gordon Elliott-trained pair Empire Of Dirt and Don Poli – both owned like retired reigning champion Rule The World by airline chief Michael O’Leary’s Gigginstown House Stud operation – advertised their prospects when second and third in the Irish Gold Cup. Elsewhere on the last weekend before the weights for the race were released, the Paul Nicholls-trained Le Mercurey ran a stormer against Native River at Newbury. Meanwhile, at Exeter, a notably sure-footed performance by Perfect Candidate saw him live up to his name with Aintree in mind.